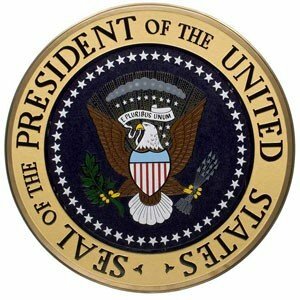 Specially designed and beautifully produced plaque suitable for display in your library, den or as part of your political collection, bearing the Seal of the President of the United States. Hand made from solid mahogany and 2" thick by artisans. Each plaque is handcrafted and brand new in the original packaging. Great gift item. Ships same day Fedex Ground in USA. If you have any questions about this product by Patriotics, contact us by completing and submitting the form below. If you are looking for a specif part number, please include it with your message.